The connections with our patriot and our parish are emebedded in the epic work ‘The Actes and Deidis of the Illustre and Vallyeant Campioun Schir William Wallace’ better known simply as ‘The Wallace‘ written in the 15th century by Blind Hary. Hary’s ‘The Wallace’ is made up of 12 ‘books’ and passages from these relating to New Cumnock are presented below. 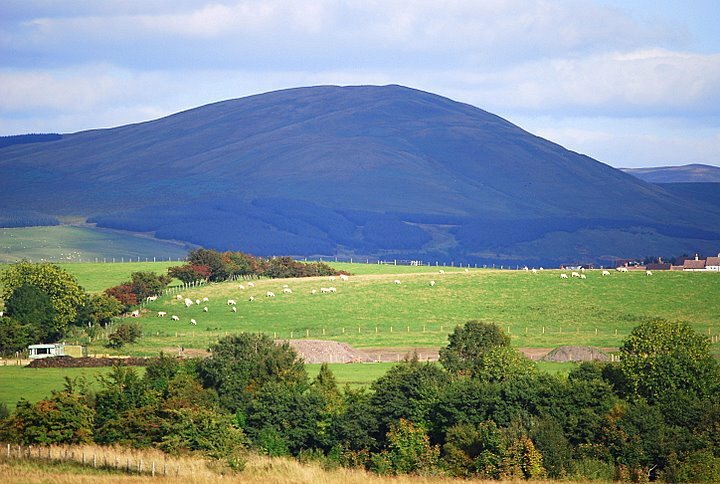 Corsencon hill stands in the east of the parish at the boundary between Ayrshire and Dumfriesshire with Corsencon farm lying on its lower slopes. 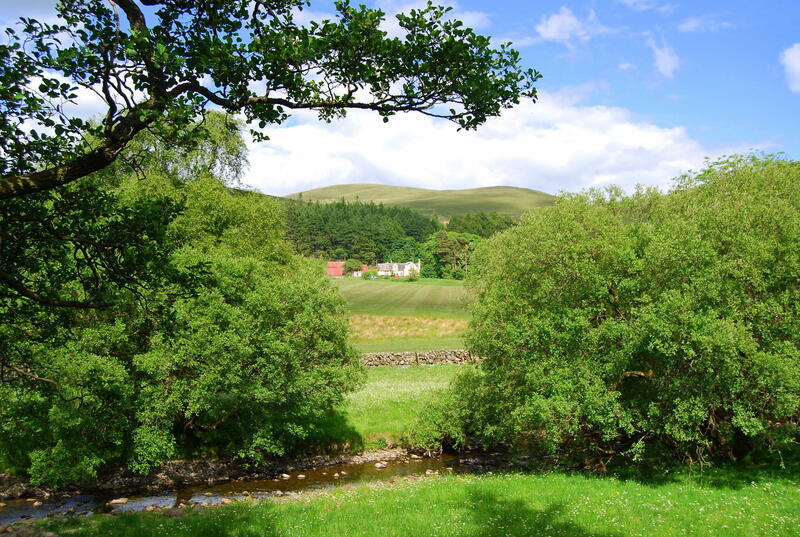 The ancient route through Nithsdale to Ayrshire passed over the back of the hill and from there to Cumnock Castle, the site of which was at the heart of what is now the village of New Cumnock. ( See Gateway). 82 Forthi that way behovid thaim for to ride. Wallace and his men were intent in entering the lands of New Cumnock by way of the ancient route through Nithsdale and past Corsencon hill. The road was destroyed (‘the gait was spilt’) forcing Wallace and his followers to take a detour which eventually saw them go by the way of Loudon hill (another ancient route into the Sheriffdom of Ayr) where they encountered and defeated an English force. Despite the victory, according to Hary , Wallace’s father Sir Malcolm Wallace of Elrisle (Elderlsie) and his eldest brother, also Malcolm, were killed at Loudon hill. We know now that Wallace’s father was not Sir Malcolm of Elrisle but Alan Wallace, a crown tenant in Ayrshire. Wallace’ s elder brother Malcom Wallace was not killed at Loudon hill and was still alive in 1299, when he attended a meeting of the Guardians. Several commentators challenge if Wallace did indeed enjoy success at Loudon hill. Matthew P. McDiarmid in ‘Hary’s Wallace’  considers ‘that this departure from the natural route was convenient for Hary’s purpose; it allowed him to use the details of Barbour’s  description of Bruce’s battle at Loudon hill‘, in May 1307. 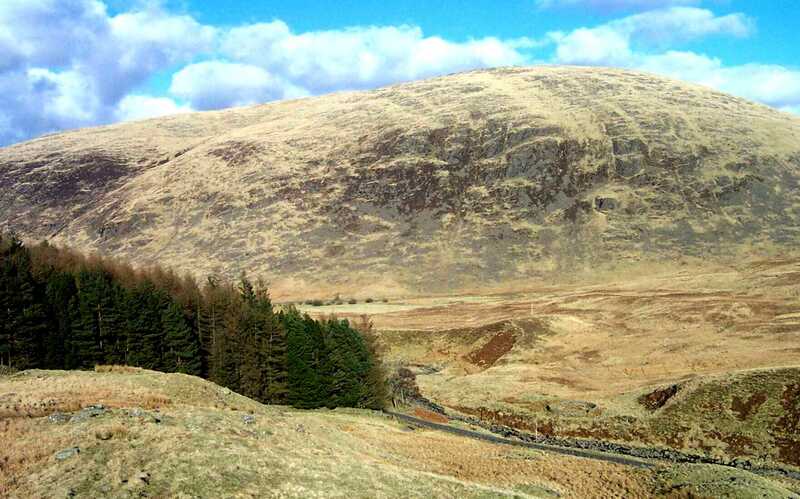 Blackcraig hill stands at the head of Glen Afton some five miles south of the village of New Cumnock. The lands of Blackcraig comprised a a cluster of farms including Nether and Over Blackcraig and during the Wars of Indpendence may well have been outwith the barony of Cumnock. 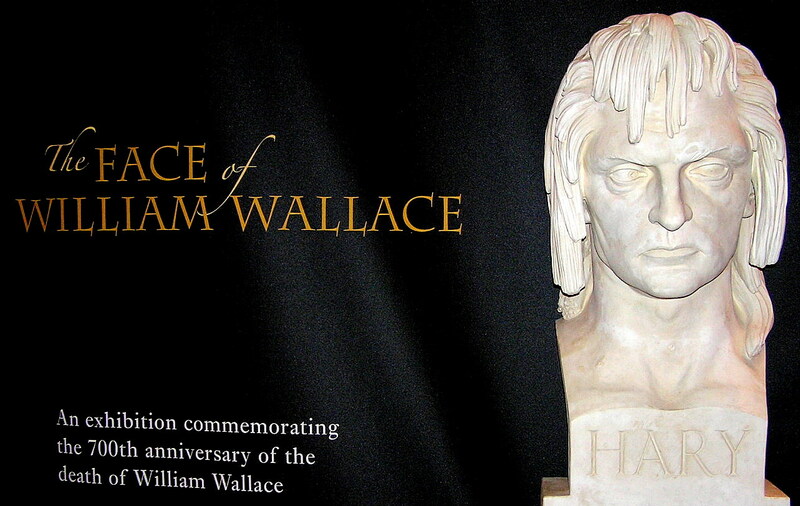 Hary has Wallace at Blackcraig on a number of occasions. 852 Mysdoaris feill he gert be punyst thar. 854 His brother sone put to his heretage. 857 Thre monethis thar he dwellyt in gud rest. 859 Trewis to tak for till enchew a chans. 853: To good men true Wallace gave large rewards. 854: Hary has Wallace taking his nephew (‘brother-sone‘), presumably his eldest brother Malcolm’s son, to his heritable estate of property and lands (‘heretage’) at Blackcraig. However, Malcolm was not as Hary intimated killed at Loudon hill and was still alive at the time Wallace was Guardian. 855-856: To the Blackcraig in Cumnock they went again. His household he set with a great force of men. Matthew McDiarmid considers Blackcraig to be ‘Blackcraig Castle, or Cumnock Castle as it was also called‘ and identifies that in 1307 ‘it belonged to the Earl of Dunbar‘. In fact, Cumnock Castle was in the hands of the Dunbars at the time of Wallace ( and probably long before that) as witnessed by the name of Patrik de Comenagh (Dunbar) appearing in the Ragman Roll (1296). However, the castle was never known by the name Blackcraig during the Dunbars tenure which continued until the early 17th century and all charters during that period refer to the castle as ‘Cumnock Castle’, or a variant of that name. The transferance of the name Blackcraig (or Black Bog) to that of Cumnock Castle appears to have originated in the early 19th century in the 2nd Statistical Account of the Parish of New Cumnock compiled in 1838 by the Rev. Matthew Kirkland  . Hary’s Black Crag in Cumno are those lands of Blackcraig in the upper reaches of Glen Afton, a name that appears in a number of charters and sasines from the 16th century onwards and that still exists to this day. Both Matthew McDiarmid and Dr. Fiona Watson  make reference to ‘Life and Heroic Actions of Sir William Wallace’ edited by Alexander Brunton and his interpretation of this passage. Alexander Brunton cuts to the chase and has Wallace returning to his dwelling where he was born and reinforces that it was a royall house. As a crown-tenant we know that William Wallace stayed loyal to the Scots crown and the claim of John Balliol. 857-859 : He rested here for three months. Cunning Englishmen (‘suttell Sotheroune’) thought it best to have a truce (‘trewis’). After the victory at Stirling Bridge in September 1297, Wallace led the Scots army over the border to lay waste to the lands of Northumberland and returned in late November. Andrew Fisher in ‘William Wallace' gives the timetable of Edward I’s response to the Scots victory at Stirling Bridge and Wallace’s attacks on England. In February 1298,the king of England sent a letter to Warrene ‘keeper of Scotland’ announcing his intention to return from Flanders and instructing him not to attempt a major campaign until he returned to take charge personally. Edward arrived back in mid-March and met with Warrene and others in York in in early April after which a summons was issued to muster an army on 25th June at Roxburgh. [N.B In the opening lines of Book VII , Hary has the English slyly agreeing to a truce from February until the end March, to buy them some time until the expected return in April of Edward I from Flanders]. This three months of good rest at the Blackcraig appears to be a reference to a period of consolidation for Wallace, now Sir William, lasting from some time after the Scots army harrying the lands of northern England in November 1297 and before the inevitable return of Edward I of England from Flanders . Professor G.W.S Barrow  assesses Wallace’s activities at this time. ‘As far as we can tell, Wallace spent this time consolidating his position and training his troops. It is likely that in the spring and early summer of 1298 Wallace kept to the South of Scotland, though no doubt he recruited men from all parts of the country to meet the full-scale invasion which he knew could not be long delayed’ . 937 Yeit sar he dred or thai suld him dissaiff. 935-940: During the three month period at Blackcraig, Wallace travelled west where he was well liked but still wary that he may be deceived , to visit his dear uncle Sir Ranald and tell him of the agreement (‘endentour’) to keep a truce. Wallace then returned to his dwelling at Blackcraig. Sir Ranald was Sir Reginald Craufurd, brother of Wallace’s mother and some time Sheriff of Ayr. 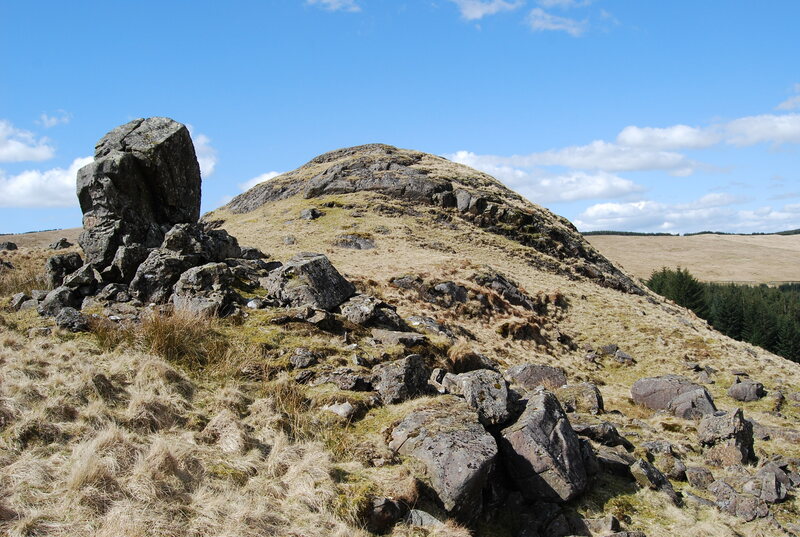 A branch of the Craufurd family held the lands of Dalleagles in New Cumnock, the first of whom on record is Roger de Craufurd in 1384, considered by Alexander Nisbet to be a descendant of Roger de Craufurd (del counte de Are) who appears in the Ragman Roll (1296). Perhaps the Wallace lands in New Cumnock were attained through the Craufurd connection. Matthew P. McDiarmid in his notes on Blackcraig ‘It would be interesting to know if this was the property of Wallace demanded by Sir David Graham.’ – his interest doubtless would have intensified if had known of Wallace’s Seal at that time. William Wallace and his men returned to their guerilla tactics of attacking the occupying English forces or to be more exact the Anglo-Scots forces. Wallace was a wanted man and his days were numbered. The final place Hary has Wallace before he sets off for Glasgow (where he is betrayed and captured on 3rd August 1305 nearby Robroyston) is at his home at Blackcraig. 936-937 And Wallace back in Cumnock in good spirits at Blackcraig where he wanted to be for at that steading he stayed as a crown-tenant. On the 23rd August 1305, Sir William Wallace was executed at Smithfield, London.